Mucinex Fast-Max adult night time cold and flu liquid relieves your worst cold symptoms with mucus-busting power and maximum strength medicines. And by night, Mucinex Fast-Max night time relieves your worst symptoms to help you get to sleep. 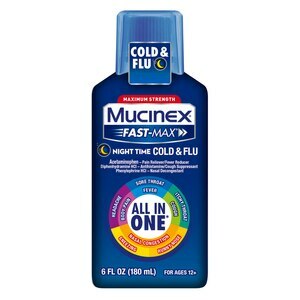 Mucinex Fast-Max adult night time cold and flu liquid contains acetaminophen, pain reliever and fever reducer; diphenhydramine HCl, cough suppressant and antihistamine; phenylephrine HCl, nasal decongestant. Mucinex helps relieve headache and fevers, controls cough, relieves nasal congestion, and relieves runny nose and sneezing. Active Ingredients: In each 20mL: Acetaminophen (650mg), Diphenhydramine HCl (25mg), Phenylephrine HCl (10mg). Inactive Ingredients: Anhydrous Citric Acid, Edetate Disodium, FD&C Blue 1, FD&C Red 40, Flavors, Glycerin, Propyl Gallate, Propylene Glycol, Purified Water, Sodium Benzoate, Sorbitol, Sucralose, Trisodium Citrate Dihydrate (May Contain This Ingredient), Xanthan Gum. Do not take more than directed (see overdose warning). Do not take more than 6 doses in any 24 hours period. Measure only with dosing cup provided. Do not use dosing cup with other products. Dose as follows or as directed by a doctor. mL = milliliter. Dose every 4 hours. Adults and children 12 years of age and older: 20mL in dosing cup provided every 4 hours. Children under 12 years of age: Do not use. Do not use for children under 12 years of age. Ask a doctor before use if you have persistent or chronic cough such as occurs with smoking, asthma, chronic bronchitis, or emphysema; cough accompanied by too much phlegm (mucus). Stop use and ask a doctor if cough lasts more than 7 days, comes back, or occurs with fever, rash, or persistent headache (These could be signs of a serious illness). If pregnant or breast feeding, ask a health professional before use. Keep out of reach of children. In case of overdose, get medical help or contact a poison control center right away. Tamper Evident: Do not use if carton is open or if seal on bottle printed sealed for your protection is broken or missing.